Increasing disability awareness one story at a time. Yooralla Speaktank is a program which provides the opportunity for people with experiences of disability to educate, raise awareness, stimulate discussions and share their own experiences with a variety of audiences. Engaging a Yooralla Speaktank speaker is great for anyone interested in learning more about disability from a personal perspective. 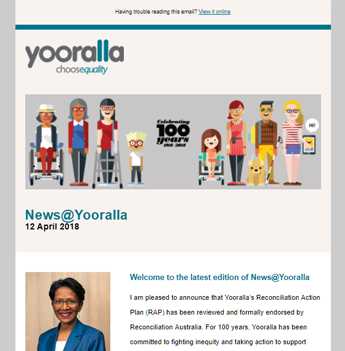 Groups who may benefit from engaging a Yooralla Speaktank speaker includes schools, community groups, local government, health professionals and corporate organisations. Interested in participating in the program as a speaker? Learn more about becoming a Yooralla Speaktank speaker. To enquire about booking a speaker for your next event, please complete an online enquiry form or call 03 9666 4500. Employing individuals dedicated to working towards a world where people with disability are equal citizens. There are many ways that you can volunteer with Yooralla. We’re all about utilising your individual skills and knowledge to help us build a better organisation. Helping us to actively support people with disability, their families and carers to live the life they choose.